2018 Big 6 WCGP Glen Helen Results – The third round of the AMA District 37/FMF Big 6 Grand Prix Series and the West Coast GP Championship came down to the final lap before it was finally decided among opening-round winner Trevor Stewart, Eric Yorba and Italian Giacomo Redondi. Stewart (Johnny Campbell Racing/Honda) led most of the race but was slowed by lappers towards the end, allowing Yorba (FMF/Maxxis/RPM Racing KTM) and Redondi to catch up, setting the stage for a final-lap shootout for the win. The three riders battled back and forth with Redondi nipping Yorba at the finish line to take the win. Stewart took a disappointing but close third. Fourth went to GNCC Champion Kailub Russell (FMF KTM) whose bike stalled right at the start of the race. As a result, he spent the next hour and a half trying to make up for lost ground. He ended up finishing approximately 30 seconds behind Yorba. Zach Bell (3 Bros Husqvarna), who won round two, was fifth overall. He took the checkers approximately a minute and a half behind Russell. Suzuki’s Gary Sutherlin, the 2017 WORCS and AMA Hare & Hound Champion, suffered multiple injuries in a crash and did not finish the race. Sutherlin said that while battling Russell and Ricky Dietrich for fourth place, a lapper forced him off the track and out of the race. He hit his head in the crash and suffered a sprained neck, bruised ribs and an injured collarbone and hand. In WCGP Pro II, Clay Hengeveld (Northland Motors / Kawasaki) took the win with room to spare over Suzuki rider Tallon La Fountaine. Beau Baron (Honda) took third right behind La Fountaine. 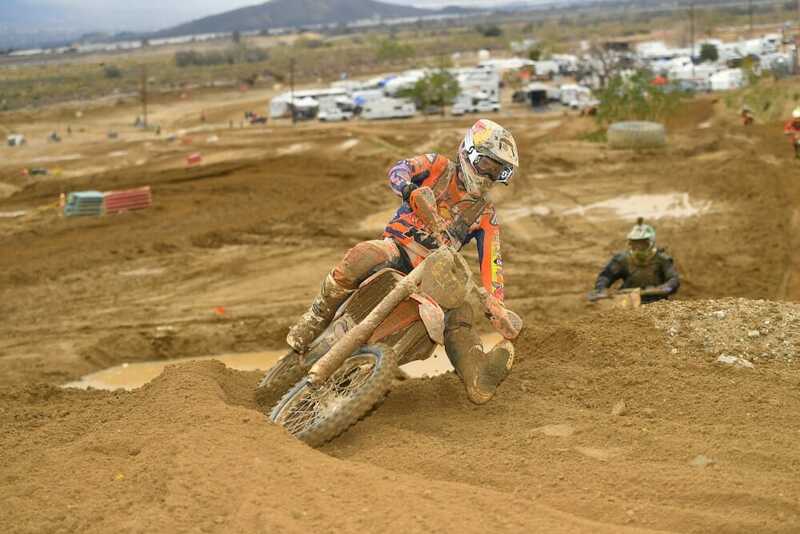 Brandy Richards (KTM) won the WCGP Women’s Pro class, followed by Tarah Gieger (Honda) and Kacy Martinez Coy (FMF KTM).